The University of Notre Dame will confer 3,020 degrees during Commencement Weekend May 17 and 18 (Saturday and Sunday) on campus. 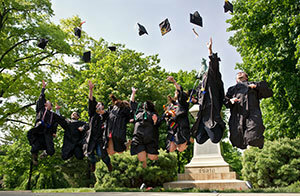 Degrees will be conferred on 1,996 undergraduates at Notre Dame’s 169th University Commencement Ceremony on Sunday. Rev. Dr. Ray Hammond, founder of Bethel African Methodist Episcopal Church in Boston, will be the principal speaker and the recipient of an honorary degree. Kenneth R. Miller, professor of biology at Brown University, will receive the 2014 Laetare Medal, the oldest and most prestigious honor given to American Catholics. Mark Santrach, an architecture major from St. Paul, Minnesota, will deliver the valedictory address. In addition to Rev. Hammond, other honorary degree recipients are W. Douglas Ford, former Notre Dame Trustee and retired oil industry executive; Evelyn Hu, professor of applied physics and electrical engineering at Harvard University; Judith Jamison, artistic director emerita of the Alvin Ailey American Dance Theater; Sally Mason, president of the University of Iowa; and Cardinal Seán O’Malley, O.F.M. Cap., archbishop of Boston. On Saturday, an additional 401 students will receive master’s and doctoral degrees at the Graduate School Commencement Ceremony, along with 427 master’s degree students at the Mendoza College of Business Ceremony and 196 at the Law School Ceremony. The undergraduate college and department diploma ceremonies beginning approximately 1 p.m. Sunday. Originally published by Michael O. Garvey at news.nd.edu on May 12, 2014.